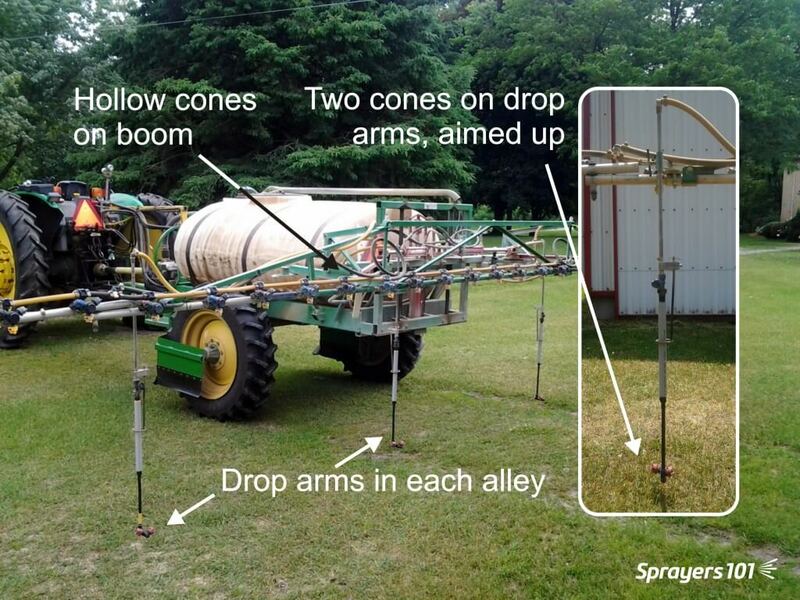 Home > Boom Sprayers > Coverage > Directed & Air-Assist > Nozzles & Droplets > Speciality Sprayers > The perfect sprayer boom for ginseng? 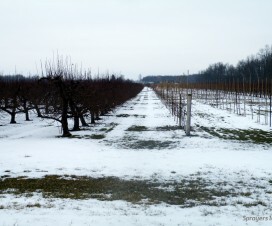 In 2013 we ran a sprayer coverage demonstration in a ginseng garden in Norfolk County, Ontario. 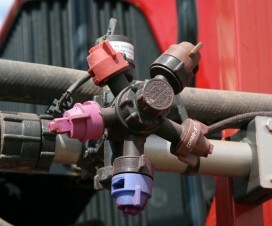 The goal was to encourage growers to reconsider their spray operation with an eye to coverage. We performed a down-and-dirty comparison between simple disc-core nozzles and the considerably more expensive Arag Microjets, and while opinions were mixed, I was confident the humble disc-core could do the job. One grower took the day to heart. Having experienced Alternaria infection (likely due to frost damage) in the outer rows, he decided to buy a few packages of water-sensitive paper and put his spray boom to the test. Multiple ground speeds, nozzle choices, pressures, spray volumes and even nozzle orientations were tested, and they led him to what I will call “ideal coverage” from what may be the perfect boom for ginseng. Possibly the “perfect” ginseng spray boom. 25 hollow cones and four drop arms sporting 2 full cones apiece. On June 15th, the temperature was about 22 °C, winds were light and humidity was about 40%. The nozzle arrangement was 24 D4-45’s (hollow cones) on the horizontal booms, spaced every 50 cm (20 inches). The grower built four drop arms, hung over each alley (not just behind the wheels) with twin bodies that each held two D5-35’s (full cones), for a total of eight dropped nozzles. His output was ~1,000 L/ha (115 US gallons per acre) and he sprayed at ~14 bars (200 psi) and he was travelling at ~7.2 kilometers per hour (4.5 miles per hour). 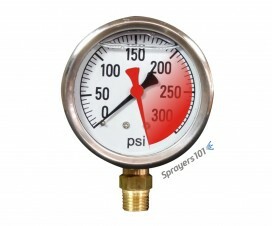 That’s low pressure for ginseng, and a reasonable ground speed given the art of negotiating a sprayer under shade cloth. It’s also surprisingly low volume. Collectively, this is a savings in fuel, water and pesticide. Water-sensitive papers were placed in seven positions (see Figure 2) in a three-year old garden. In each position, the cards were folded so the paper wrapped around the stems and could show coverage facing each alley. It’s not panoramic, but it’s very good. They were placed on the stems just above the ground, and just below the canopy on three plants. The seventh card was folded over the uppermost leaf, to show coverage on the top, and underside of the leaf. Water-sensitive papers corresponding to the numbered positions in the earlier illustration. Cards were folded around the stems to face each alley (Cards 1-6) and around the top leaf for surface and underleaf coverage (Card 7). There are some drenches, but no misses. The coverage was excellent. 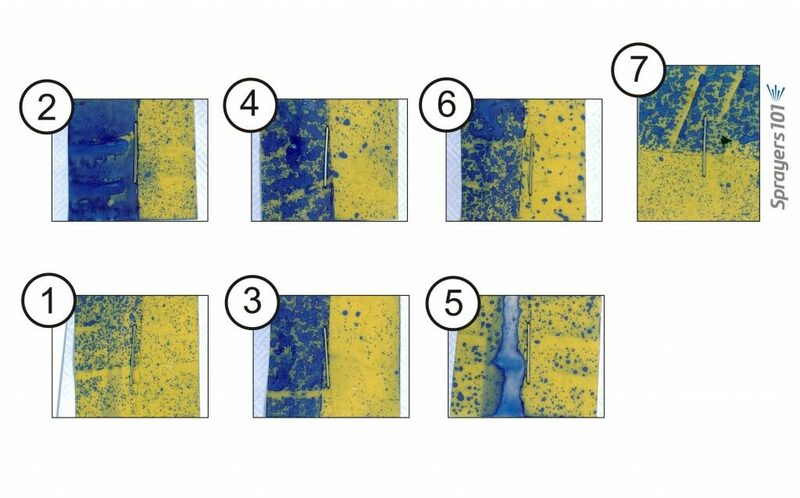 A completely blue card represents a drench, which isn’t necessary but can be difficult to avoid when trying to spray all surfaces in a dense canopy. The speckled coverage doesn’t miss at all. With a goal of 15% coverage and 85 droplets per cm2 as a goal, even the under-leaf coverage (lower half of card 7) shows a great pattern. The trick, you ask? The full cones on the drop arms are aimed so the bottom of the cone is parallel with the ground (essentially, aimed up about 30°). That creates a cloud of spray moving under the canopy, impinging on all surfaces. 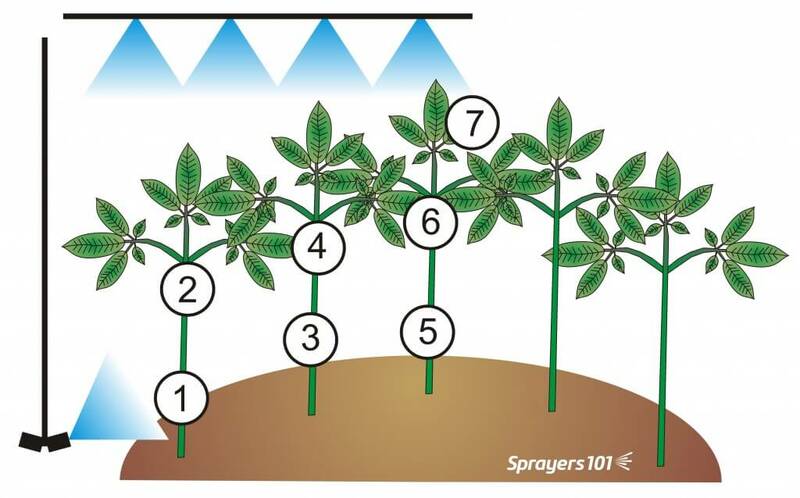 It is important to not spray the cone into the ground or the raised mound, and it is important to spray in from both sides, so drops must be placed in each alley. The drops themselves have been modified so they are flexible enough to move through an overgrown 3rd or 4th year garden (yes, there will be some leaf damage), but are also stiff enough not to sway. 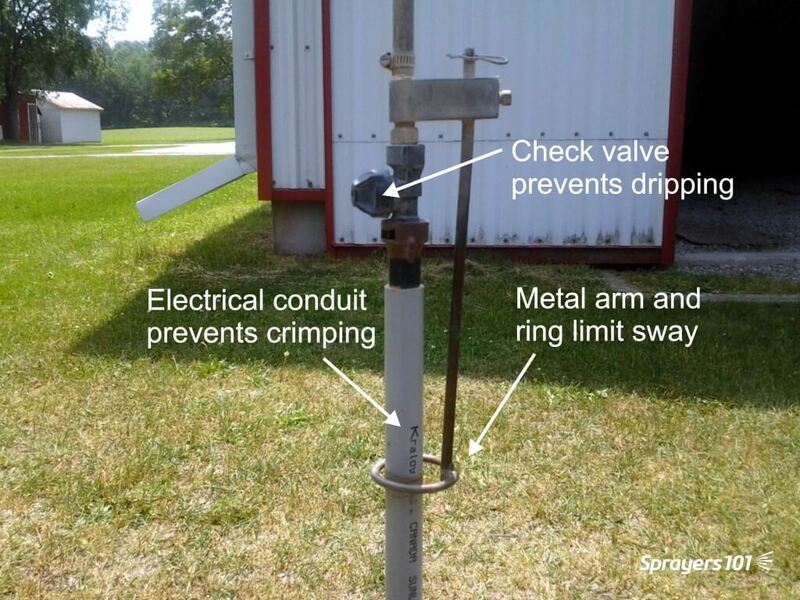 This was accomplished by sliding a sheath of electrical conduit over the drop arm, and using a metal stabilizing arm that terminates in a ring around the conduit. So, I’ll be the first to admit that coverage does not necessarily mean efficacy, but with the right timing and product choice this method of spraying will be hard to beat. And it’s cheap! It’s going to save fuel and wear because of lower pressures, and save spray mix because he can go a lot farther on a tank spraying only 1,000 L/ha. For more information, check out the OMAFRA spraying factsheet for ginseng. Special thanks and congratulations to Richard Klosler of Micheal Klosler Farms Ltd. for his great boom design!